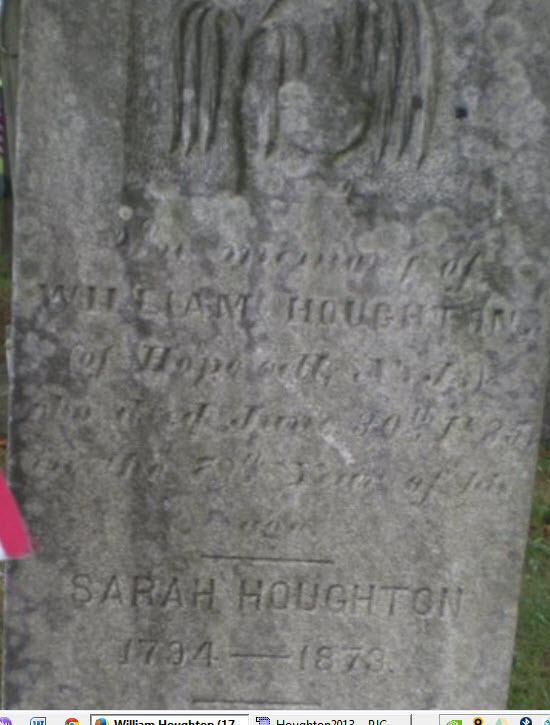 Anne Houghton married John Smith in 1753 at Hunterdon Co., NJ, USA. possible explanations, but not enough evidence to make a firm conclusion. There could have been two William Drakes. Thanks for your time. Some day I hope to get this all resolved for sure. "...absolute evidence that the Mary Houghton who married William Drake was the daughter of Joab and Catherine Houghton. In the book, Our Houghton Heritage, on page 65 is a document that contains the signature of William Houghton's (son of Joab and Catherine) brothers and sisters. Among these signatures is that of "Mary Drake". This document is dated December 16, 1801. In the same book on page 23, we have the will of Thomas Houghton, brother of Joab Houghton in which he states: "I give and Bequeath unto my Niece Mary Drake a pair of Sheats and two Coverlids." This will was written on 21 Dec 1784. It should also be noted that Thomas never mentions a sister Mary in this document, so one must assume that she was dead." Mary Houghton married William Drake. Alice Houghton married Abraham Stout in Jan 19, 1774 w/2. Abraham Stout married Elizabeth Houghton, daughter of Thomas Houghton and Maria Mershon, in 1755 w/1; MLM: also gives marr. Sept. 27, 1755, Elizabeth Herbert. Abraham Stout married Alice Houghton, daughter of Thomas Houghton and Maria Mershon, in Jan 19, 1774 w/2. Abraham Stout married Ann Stout in Oct 26, 1775. John Merrill married Sarah Houghton, daughter of Thomas Houghton and Maria Mershon. John Smith married Anne Houghton, daughter of Thomas Houghton and Maria Mershon, in 1753 at Hunterdon Co., NJ, USA. William Drake married Mary Houghton, daughter of Col. Joab Houghton and Catharine Runyan. Problem Birthdate: He supposedly was born in 1755, but that means his last 2 kids were born when he was 69 and 76 years old. It may be 1775 or 1778 which makes more sense. But that elimates his Rev. War service per DAR. Joab Houghton Jr married Phebe (?) w/1. Joab Houghton Jr married Abigail Wood in Nov 13, 1809 at Mason Co., KY, USA, w/2. William Houghton married Margaret Sexton in Oct 20, 1793 at Hopewell, NJ, USA. Sarah Houghton married Amos Corwine. Alice Houghton married Conant Cone in May, 1780. Amos Corwine married Sarah Houghton, daughter of Col. Joab Houghton and Catharine Runyan. Death Aug 31, 1834 Barr Twp, Daviess Co., IN, USA, H. Houghton, p. 113, dp and Aug 13. William Houghton married Celia Ann McKay in May 10, 1803 at Mason, KY, USA, Lint: Oct. 17. Charles Pickerel Houghton married Elizabeth VanDeventer in Nov 21, 1810 at Mason Co., KY, USA, H. Houghton: 1807. Sarah Ann Houghton married Abraham Golden in Nov 6, 1806 at Mason Co., KY, USA. Celia Ann McKay married William Houghton, son of Aaron Houghton and Elizabeth Sexton, in May 10, 1803 at Mason, KY, USA, Lint: Oct. 17. 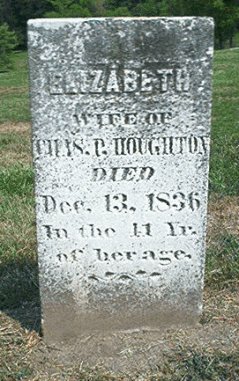 Elizabeth VanDeventer married Charles Pickerel Houghton, son of Aaron Houghton and Elizabeth Sexton, in Nov 21, 1810 at Mason Co., KY, USA, H. Houghton: 1807. Abraham Golden married Sarah Ann Houghton, daughter of Aaron Houghton and Elizabeth Sexton, in Nov 6, 1806 at Mason Co., KY, USA. Cox-- who names Charlotte, and confirms her d. date as c.1819, if she was b.
date of her next younger sister, Mary, who was b. c.1784 according to Cox. 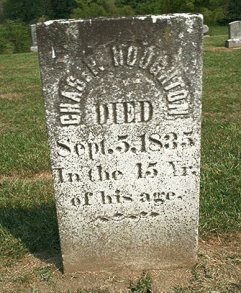 Charlotte Hart married Elijah Houghton, son of Aaron Houghton and Elizabeth Sexton, in Feb 5, 1803 at Mason Co., KY, USA. Elizabeth Lucas married Joab Houghton Corwine, son of Amos Corwine and Sarah Houghton. Margaret Sexton married William Houghton, son of Col. Joab Houghton and Catharine Runyan, in Oct 20, 1793 at Hopewell, NJ, USA. Conant Cone married Alice Houghton, daughter of Col. Joab Houghton and Catharine Runyan, in May, 1780. Phineas Willard married Mary Sawyer, daughter of William Sawyer Sr. and Mary Houghton. 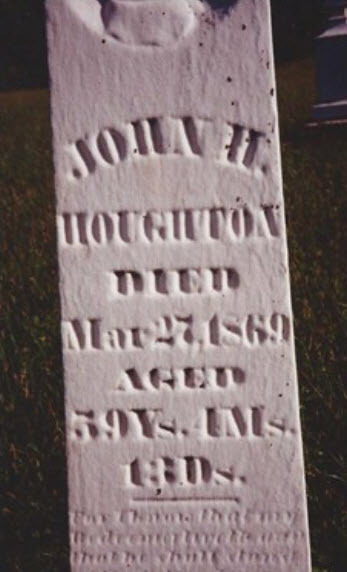 John Hart Houghton married Ellen LeMar in Oct 16, 1834 at Sangamon (Menard) Co., IL, USA. 1850 Census 1850 Dist. 4, Sylvester, Green Co., WI, USA, age 46, farmer; with Polly Ball, 51, PA; Amanda M. Ball, 15, PA; Sylvia M. Ball, 13, PA; Wilder M. Ball, 20; and the Sylvester R. Stephens family. Alfred Gleason Houghton married Priscilla W. Summerill in Apr 7, 1852 at Green Co., WI, USA, Green Co. Marriage Record, vo. 1, p.201. Susan Grayson Houghton married John G. Conover in Sep 5, 1833 at Sangamon Co., IL, USA, H. Houghton: 4 Sep 1845. John G. Conover married Susan Grayson Houghton, daughter of Elijah Houghton and Charlotte Hart, in Sep 5, 1833 at Sangamon Co., IL, USA, H. Houghton: 4 Sep 1845. John G. Conover married Hannah Brisby in Apr 7, 1846. Phebe M. Houghton married Charles Willett Masterson in Sep 30, 1841 at Menard Co., IL, USA, Lic. 94, Book A, p. 16. Andrew Merrill Houghton married Barbara Ann Renshaw in Apr 9, 1856 at Sangamon Co., IL, USA. Mariah E. Houghton married F. E. Stevenson in Apr 4, 1855 at Menard, IL, USA, Lic. 871, Book A, p. 140.